Did you know that the University of Notre Dame can consistently be found on the list of top 20 universities across the nation? Were you aware that the university has 430 student clubs and organizations available, which include a variety of social, cultural, intellectual, recreational, religious, and governance programs so that every student can find a place where they fit in? Has it come to your attention that 48 percent of undergraduates receive some form of financial assistance directly from the university? Did you realize that when you buy licensed Notre Dame gear, you’re helping to support all of this and more? It’s true, when you buy a licensed Notre Dame product, a portion of the proceeds goes back to Notre Dame’s general fund. This fund supports teaching, research, student groups, financial aid, and many other campus initiatives. 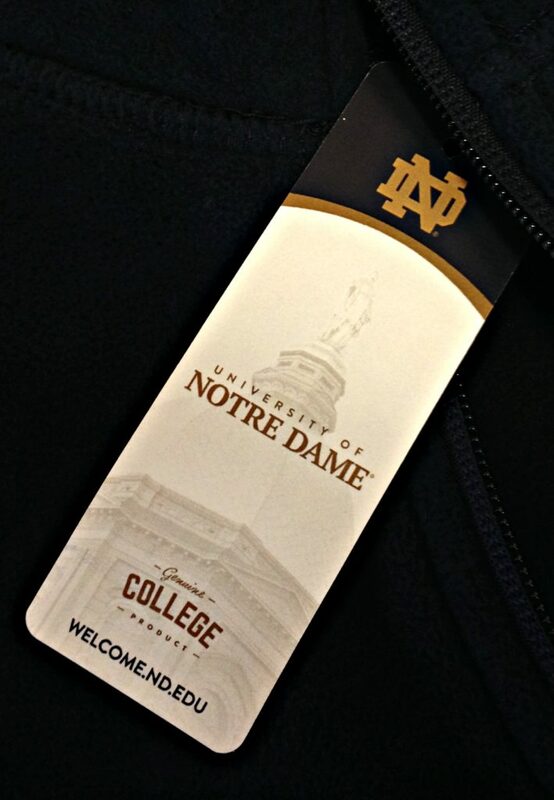 The benefits of buying licensed products go beyond Notre Dame’s home campus, and reflect back to our licensees across the world. During the process of evaluating new license applications, we ask many questions about licensees’ manufacturing practices. We look for companies that have a strong Code of Conduct and that have relationships with their factories. We also require that every retail licensee be a member of the Fair Labor Association. Through the FLA, many companies are required to complete assessments of their supply chain, and look for areas that need improvement. We work closely with our licensees so that working conditions can continually improve over time. As you can see, each purchase of a licensed product supports the goal of fair working conditions for everyone around the world. How do you know what is a licensed product and what is not? The simple answer is to look for the “Genuine College Product” tag or sticker attached to the merchandise. If a product has one of these, then you’re good to go. If it doesn’t, it is not a licensed product of Notre Dame. Buying your Notre Dame gear from Hammes Bookstore is a great way to ensure that what you buy is definitely licensed by the University. Always be sure to do your homework and double check that the item you want to buy is one that the University supports. If you come across an infringing product, don’t panic, there is a way you can help. If you spot infringement,you can report it to us directly at: http://licensing.nd.edu/contact/ or through our licensing agent, Fermata Partners: http://fermatacollege.com/report/. All reports are confidential. We thank everyone who buys Notre Dame licensed products, for you are a part of something great. With your help,we are promoting ethical work environments across the world as well as ensuring that our students here at the University are getting the best education and opportunities possible!